Would you like to update your current type of business? *Retail price: this price is just an indication of a possible resale price of your selected trade partner, included for indicative reference purposes only. Your actual purchase price is subject to the agreement between you and your selected trade partner, and could thus be lower or higher. Create great variety of dips to excite your diners, every time. A spoonful of Lady's Choice Real Mayonnaise has the perfectly balanced taste to let you create delicious dips. Soybean Oil, Water, Eggs, Sugar, Vinegar, Iodized Salt, Stabilizer (Propylene Glycol Alginate), Spices, Preservative (Potassium Sorbate), Nature Identical Flavor, Color (Beta Carotene). Calcium Disodium Edta Added To Protect Flavour. Contains: Soybeans, Eggs, Milk Products. Lady's Choice Real Mayonnaise is made with real eggs, soybean oil and vinegar. Soybean oil naturally contains Omega 3, a group of essential fatty acids. 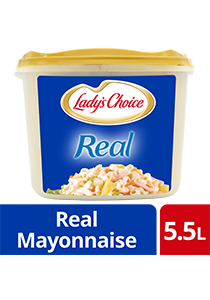 Lady's Choice Real mayonnaise is your best choice for all traditional applications of mayonnaise such as - base for elaborated cold sauces - salad dressings - sandwich spreads and fillings. List Price (Vat Inclusive) Product not available. Register for our eNewsletter to keep up to date! By signing up now, you will receive recipes, industry trends, free samples and more to make you one step ahead from your competitor!